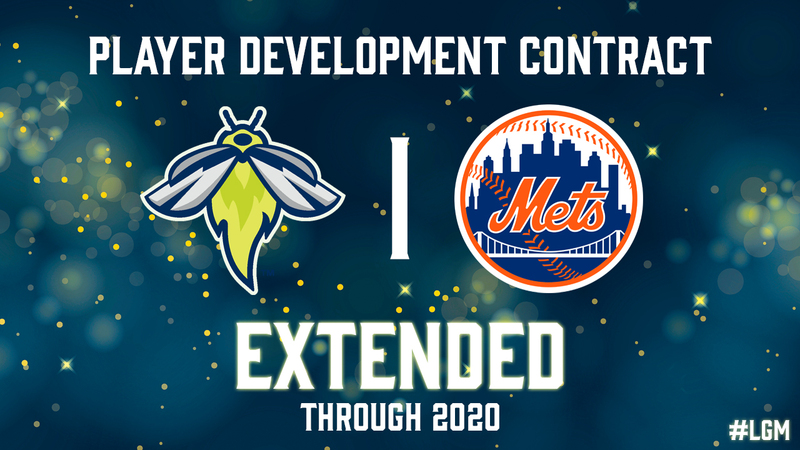 COLUMBIA, S.C. - The Columbia Fireflies and New York Mets today announced that they are extending their Player Development Contract (PDC) through the 2020 season. The Mets have been affiliated with Hardball Capital's South Atlantic League franchise since 2007 when the team was located in Savannah, Georgia. The affiliation followed the team to Columbia when they became the Fireflies in 2016. The Mets are no stranger to fans in the Midlands as they were the Major League affiliate for the Columbia Mets / Capital City Bombers from 1983 until 2004. "We're excited to extend our relationship with the New York Mets through 2020," said Fireflies team President John Katz. "We've had a terrific working relationship with the Mets for over a decade, and we look forward to watching their future stars play here at Spirit Communications Park." The announcement comes a few months after the Mets announced the purchase of the Syracuse Chiefs. Starting in 2019, the Mets triple-A affiliate will be much closer to home moving from Las Vegas to Syracuse. This move makes the Fireflies one of the few remaining Mets Affiliates outside the state of New York. "We are extremely happy that we will be in Columbia for at least the next three years," said New York Mets General manager Sandy Alderson. "Jason Freier, John Katz and all their staff do a terrific job for our players and for Fireflies fans." Although no Fireflies have yet to don the royal blue and orange at Citi Field, six former players were invited to major league Spring Training this year. That list includes P.J. Conlon, Kevin Kaczmarski, Patrick Mazeika and David Thompson - all of whom played in Columbia in 2016. Tim Tebow and Adonis Uceta round out the list of invitees - both members of the 2017 Fireflies roster. Season ticket packages are now available for the 2018 season. Reserve your seats by calling the Fireflies Ticket Office at 803-726-HITS or visiting www.ColumbiaFireflies.com for more information. 2017 season ticket members can renew their package by contacting their ticket account manager or by calling the ticket office. Plans start as low as $99. Individual game tickets will be available closer to the 2018 season. Tickets for the University of South Carolina vs. College of Charleston baseball game on Wednesday, May 9th are now available for sale. Tickets can be purchased at the Fireflies box office, online at ColumbiaFireflies.com or over the phone at 803-726-HITS. The Columbia Fireflies are the South Atlantic League affiliate of the New York Mets. Winners of Ballpark Digest's Best New Branding and Logo Award in 2016, the Fireflies play games across the southeast and mid-Atlantic regions, including against in-state rivals in Charleston and Greenville. The team partnered with the city of Columbia and Hughes Development to construct Spirit Communications Park, a multi-use outdoor sports and entertainment venue at the center of the BullStreet District. The Columbia Fireflies are owned by Hardball Capital, owners of the Fort Wayne TinCaps of the Midwest League and the Chattanooga Lookouts of the Southern League. For more information, visit www.ColumbiaFireflies.com, or follow the Fireflies on Twitter (@ColaFireflies), Facebook (facebook.com/columbiafireflies) and all popular social media platforms. Spirit Communications Park, the 2016 Ballpark Digest Ballpark of the Year, is a 365-day per year multi-use sports and entertainment venue located in the heart of downtown Columbia, South Carolina. Spirit Communications Park is the home ballpark for the Columbia Fireflies, the South Atlantic League affiliate of the New York Mets. Designed for baseball, concerts, football, soccer and a host of other activities, the venue seats approximately 9,000 for sporting events and up to 15,000 for major outdoor concerts. With 16 luxury suites and a 7,000 square-foot Club Level Lounge, Spirit Communications Park also hosts everything from business meetings to wedding receptions, and everything in between. The venue is open 365 days a year and serves as a public park, with a wrap-around concourse representing 1/3 of a mile for walkers and joggers. For more information, visit www.SpiritCommunicationsPark.com.